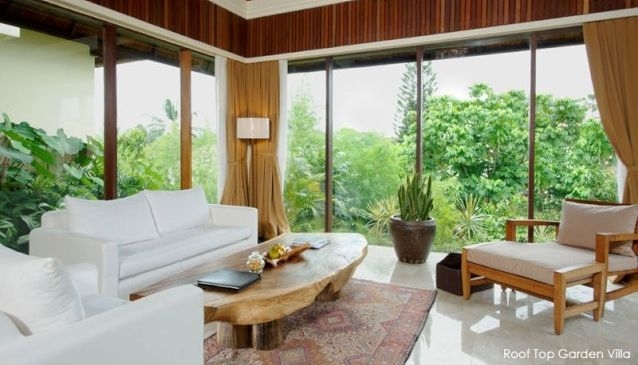 With the many wonderful shops, excellent restaurants and easy access to temples, cultural performances, museums and art galleries in the vicinity, this #Bali hotel is dedicated to giving guests a luxurious and relaxing Bali vacation. It is designed as a contemporary interpretation of traditional Balinese architecture and built with simple yet fine materials. Komaneka at Rasa Sayang will complement the first and iconic Komaneka at Monkey Forest to make an authentic and unforgettable experience in #Ubud, Bali. This #Bali hotel with tropical gardens and the comfort of modern facilities make it an ideal holiday destination to stay in Ubud - Bali. Accommoadtion: Roof-top Garden Villas and Deluxe Rooms. Komaneka at Rasa Sayang is surrounded by lush vegetation and an abundance of exotic plants, an oasis yet close to Ubud's bustling activities and picturesque Monkey Forest Road and its famous shops and restaurants. Photos.